It's been a whirlwind 3 months - while moving from Colorado to Florida, going on two big road trips and wrapping my head and heart around a bunch of... well, stuff. During May and June, I actually listened to a lot of older music - but these favorite new discoveries from April, May and June 2018 made up a lot of my spring soundtrack. Hope you hear something you like. 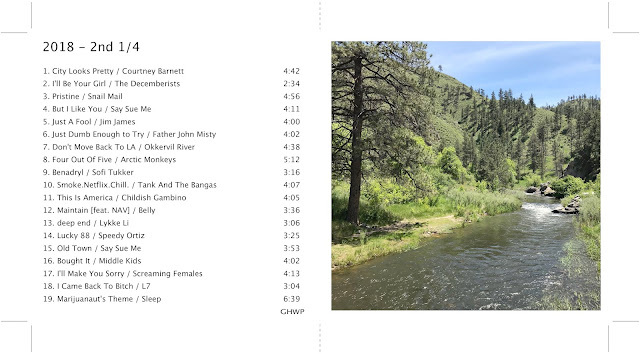 CD cover for the 2nd 1/4 of 2018 Favorites features a photo of the North Fork of the Cache la Poudre River I took in May. As usual, the mix spans exactly one CD. So if you want one, let me know. Otherwise you can listen to the entire mix on Spotify or check out the songs that have videos in the Pinterest music board and Google+ music video collection.